Origen, the Hexapla & its Institute | Septuaginta &c.
Just a brief post to convey the exciting news in the Septuagint blogosphere (which doesn’t happen very often): the Hexapla Institute‘s website is back up and running (thanks, Brian!). A cooperative venture by The Southern Baptist Theological Seminary (spearheaded by Peter Gentry), VU University Amsterdam, and the University of Oxford, this project is attempting to assemble a new critical edition of Hexaplaric fragments. Essentially, this means that any ancient scraps of the Hexapla are being rounded up, examined, and text-critically adjudicated to determine the most original reading. The project, which will also provide online databases, will also shed further light on Greek rabbinical exegetical practice. Overall, the Hexapla Institute is undertaking an exciting – if daunting! – project. Read more about its history here. The Hexapla (Ἑξαπλᾶ) was produced in the 3rd century by Origen of Alexandria. 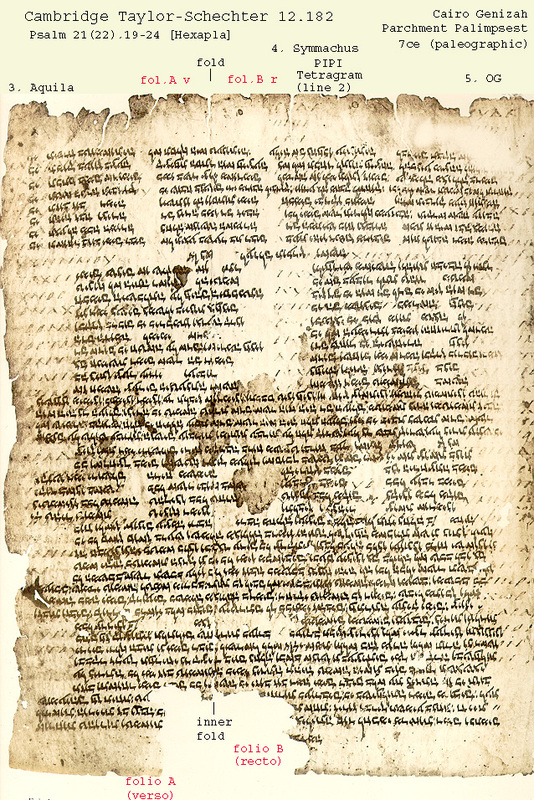 By his day, several recensions of “the” Septuagint had already been completed (see chart at left), leaving religious communities in conflict over textual authority. For the most part, the Church had claimed the Greek Septuagint, while Jews laid hold of the Hebrew text. Origen considered the Greek texts to be significantly flawed, however, due to ordinary corruption in textual transmission, translational modification or error, and controversy over the “standard” Hebrew text. Origen assumed his received text (textus receptus) was correct. That assumption was both Origen’s point of departure and methodological flaw. In any case, Origen decided to attempt to sort it all out, although it’s not totally clear what his primary purpose was in doing so. But it purportedly took him over 6,000 pages in 15 volumes to do it. Using the symbols of Aristarchus in his critical edition of Homer, Origen laid out six columns in which to denote how the textual versions related to one another. The asterisk (※) designated words added to the LXX, typically from one of the recensions, and a metobelus (↙) to mark the end of the textual insertion. He also used an obelisk (÷) to mark places in the LXX that were additional to the Hebrew. It’s not perfectly clear how Origen did this, and debate continues. But Origen’s textual work focused on Column 5. Regrettably, Origen’s work never bore much fruit. It is doubtful that the entirety of the Hexapla ever existed in more than a single copy simultaneously. The fragments we have are copies, which in the course of events were themselves corrupted by erroneous copying of Origen’s sigla (!). In the end, the original Hexapla was destroyed during a Muslim invasion in the 7th century. The stated goal of the Hexapla Institute is to produce new critical editions, representing the most accurate “original” Hexapla to date. Prior editions (see here) will be superseded by the addition of textual data from new manuscripts, patristic sources, and newer editions of the Church Fathers. Given the profound influence of the Hexapla upon the textual history of the Old Testament, the work of these capable scholars will no doubt be welcomed. Thanks for the shout out, Will. On another note, I noticed that we are presenting in the same IOSCS section in San Diego. I look forward to meeting you in person. Blessings on your studies in Cambridge! Hi John, yes, that looks right! Should be fun. See you there! Pingback: Supervisors & Programs for Septuagint Studies – Part III | Septuaginta &c.